March 24, 1999 will go down in history as a day of infamy. 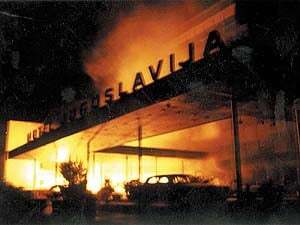 US-led NATO raped Yugoslavia. Doing so was its second major combat operation. It was lawless aggression. No Security Council resolution authorized it. NATO’s Operation Allied Force lasted 78 days. Washington called it Operation Noble Anvil. Evil best describes it. On June 10, operations ended. From March 1991 through mid-June 1999, Balkan wars raged. Yugoslavia “balkanized” into seven countries. They include Serbia, Kosovo, Montenegro, Macedonia, Bosnia-Herzegovina, Croatia and Slovenia. Enormous human suffering was inflicted. Washington bears most responsibility. Diana Johnstone’s book titled “Fools’ Crusade: Yugoslavia, NATO and Western Delusions” is a definitive account of what happened. Claims about Milosevic’s “Greater Serbia” ambitions were false. Washington-led wars wanted Yugoslavia balkanized. Germany was very much involved. Both countries encouraged cessation. They provoked conflict. After ravaging and destroying Yugoslavia, they took credit for ending it. After the 1995 General Framework Agreement for Peace in Bosnia and Herzegovina (the Dayton Accords), “Bosnia-Herzegovina (was) ruled by…a complicated set of local authorities under the strict supervision of a ‘High Representative’ (a contemporary Proconsul or Viceroy) who can, and does, annul laws adopted by the local democratic institutions or dismiss democratically chosen officials” not supportive of US imperial aims, said Johnstone. In other words, democracy was verboten. It prevented from emerging. Washington rules were instituted. Colonization ended Yugoslavia’s market socialism experiment. Predatory free-market harshness replaced it. Complete with IMF-imposed financial terrorism. In October 1998, a NATO air verification mission was agreed to for Kosovo. In November, Milosevic agreed to a framework political settlement. A second Verification Mission was established to assure compliance with UN Security Council Resolutions 1160 and 1199. The former banned arms sales to Serbia. It imposed economic sanctions. The latter ordered both sides in Kosovo to end hostilities and observe a ceasefire. The so-called February 1999 Interim Agreement for Peace and Self-Government in Kosovo (the Rambouillet Agreement) was prelude for war. It was an ultimatum Milosevic couldn’t accept. It was designed for rejection. It was a take-it-or-leave-it demand. It ordered Milosevic to surrender Federal Republic of Yugoslavia (FRY) sovereignty to a NATO occupation force. It demanded unimpeded access to its land, airspace and territorial waters, as well as any area or facility therein. It required the FRY to let NATO freely operate outside federal law. Demanding it was outrageous. Milosevic’s justifiable refusal became pretext for war. It followed mercilessly. Nobel laureate Harold Pinter denounced what happened. For 78 days, around 600 aircraft flew about 3,000 sorties. Thousands of tons of ordnance were dropped, as well as hundreds of ground-launched cruise missiles. Up to then, its ferocity was unprecedented. Nearly everything was struck. Massive destruction and disruption followed. Known or suspected military sites were targeted. Cities, villages and other areas were struck throughout the country. NATO began running out of targets. It didn’t matter. Bombing continued relentlessly. It was willful, lawless aggression. Horrendous war crimes were committed unaccountably. Humanitarian disaster followed. Outrageous claims about humanitarian intervention were fraudulent. Washington claimed another imperial trophy. The former Yugoslavia no longer exists. An estimated $100 billion in damage was inflicted. Environmental contamination was extensive. Large numbers were killed, injured or displaced. Two million people lost their livelihoods. Many their homes and communities. Most their futures. Serbia’s sovereign Kosovo territory was lost. It’s now US/NATO occupied territory. It’s home to Camp Bondsteel. It’s one of America’s largest military bases. Kosovo is run by Hashim Thaci. He’s a former Secretary of State Madeleine Albright protege. In 2000, she ordered then chief Hague prosecutor Carla del Ponte to exclude his name from a list of suspected war criminals. He’s a street thug posing as prime minister. He’s nicknamed “The Snake” for good reason. He remains unindicted. Washington, EU nations and UN officials elevated him to power. He’s a former Kosovo Liberation Army (KLA) commander. Post-war, he usurped power. He took control of many municipalities. It doesn’t matter. He’s Washington’s man in Kosovo. He runs it like a crime family. Friends in high places support him. Washington and complicit EU partners opened an avenue to Eurasia. A permanent US military presence was established where it previously didn’t exist. It serves America’s broader imperial agenda. Afghanistan, Iraq, Libya and Syria followed. So does slow-motion genocide in Palestine. Iran’s turn awaits. Washington’s dirty hands want Venezuela’s democratically elected government ousted. Obama’s war on humanity continues. Russia is in the eye of the storm. Global war is threatened. Neocons infest Washington. They influence administration and congressional policy. What’s ongoing bears erie resemblance to events preceding WW I. Barbara Tuchman’s “The Guns of August” explained its beginning and early weeks. One thing led to others. Events spun out-of-control. Deadly consequences followed. Before it ended, over 20 million died. Many more were wounded and/or maimed. An entire generation of youth was lost. Weapons used then were toys compared to now. A possible armageddon end times scenario looms. Irresponsible leaders risk it. Mainstream media support what demand opposition. History has a disturbing way of repeating. George Santayana famous dictum is forgotten. “Those who cannot remember the past are condemned to repeat it,” he said. Damn fools run things now like before. Today’s super-weapons make earlier ones seem like toys. Crazies act like nuclear missiles and bombs are king-sized hand grenades. Humanity’s fate hangs in the balance. Will Ukraine become a flashpoint for East/West confrontation. Will something erupt making Yugoslavia’s destruction look insignificant by comparison? Will Washington neocon extremists challenge Russia belligerently? Will mainstream media support them? Will public outrage fail to materialize? Will potential armageddon be risked? Will never again really happen this time? Einstein once said he didn’t know what WW III weapons would be used. “…WW IV will be fought with sticks and stones,” he said. Betrand Russell was an Einstein contemporary. “Shall we put an end to the human race, or shall mankind renounce war,” he asked? It’s the only way to live in peace. The alternative risks annihilation. The choice is clear. The wrong one assures potential disaster. America heads humanity dangerously toward it. Either we end wars or they’ll end us. There’s no in between. The late Michael Mandel (1948 – 2013) was among a group of law professors wanting justice. They filed war crimes charges against numerous Western officials and complicit allies. They did so at International Criminal Tribunal for the Former Yugoslavia. Notable US ones charged included Bill Clinton, Madeleine Albright, William Cohen and General Wesley Clark. European ones included Tony Blair, Robin Cook, George Robertson, Javia Solana, Jamie Shea, and numerous others – 68 in all. He called it “the farthest thing from humanitarianism.” NATO’s war was illegal, he stressed. Force is justified only in self-defense or when Security Council authorized. He explained relevant UN Charter provisions. They leave no ambiguity. They were systematically violated. So was the NATO Treaty and Canadian law. “31. (1) the Governor in Council may place the Canadian forces or any component, unit or other element thereof on active service anywhere in or beyond Canada at any time when it appears advisable to do so. “NATO has no humanitarian lessons to teach the world,” he stressed. “Much more plausible than the humanitarian thesis is the one that the United States deliberately provoked this war, that it deliberately exploited and exacerbated another country’s tragedy…for purely selfish (political) and economic” reasons. It ravaged and destroyed a country for power and profit. War crimes charges against culpable officials are warranted. Grave international law breaches were committed. No Western or complicit official was held accountable. Justice remains denied.